A Ruler For Windows is a small on-screen gadget by Rob Latour which is as basic as a simple ruler. Select between a few different styles, this app can make small measurements. With it, you can flip the ruler horizontally or vertically and measure an exact amount, up to the pixel. The styles available are transparent, wooden and stainless steel. It also offers a number of keyboard shortcuts to save time. 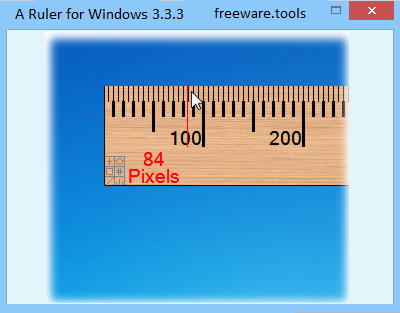 A Ruler For Windows is definitely one of the nicer ruler apps we've seen and it's useful for everybody with its option to switch between imperial and metric measurements. In other words, this is a handy, elegant and simple-to-use on-screen pixel ruler, intended for users who design websites. A Ruler for Windows has a good response time, supports keyboard shortcuts and requires a minimum quantity of CPU and RAM to work properly. All in all, A Ruler for Windows serves its purpose without burdening the user with complicated features.